Come take a look at one of D&D’s oldest dungeons. 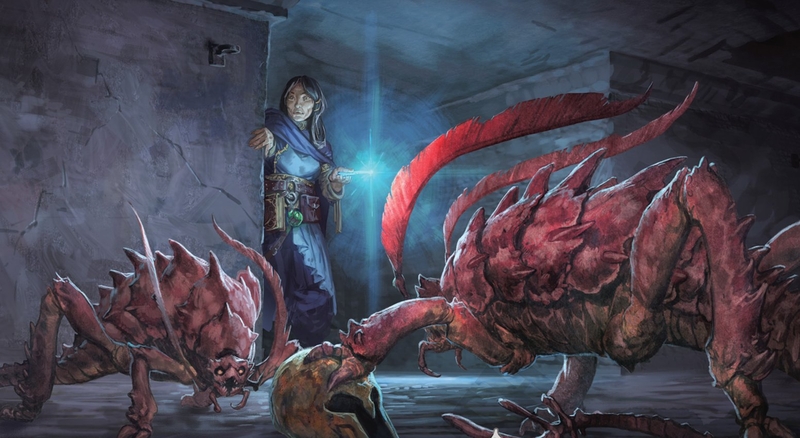 Flip to the back of the 5th Edition Dungeon Master’s Guide and you’ll step into the pages of history with a Dungeon that’s been around, waiting for adventurers to explore it since 1st Edition. One of the oldest Dungeons in D&D has no name. Appears in no module. Has no detailed listing of the monsters you’ll find inside its halls. It’s just 39 different rooms, including many your party might not find if they can’t detect one of the dungeon’s nine different secret doors–or fall into its hidden pit trap. 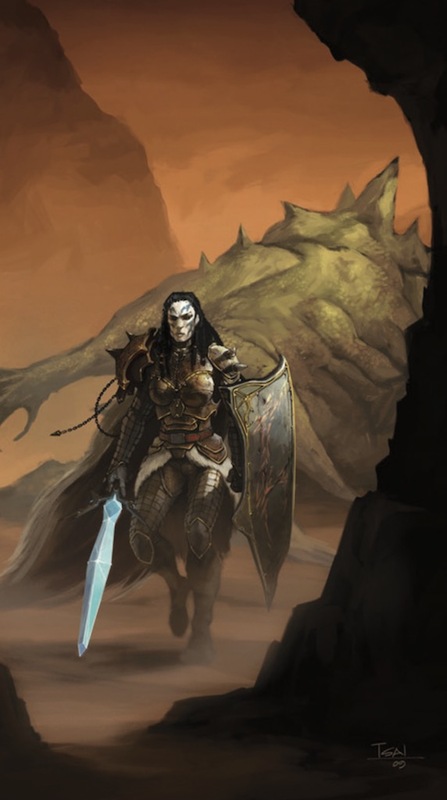 You won’t find it in any published adventure, but it has been lurking in the Dungeon Master’s Guides of many an edition–going all the way back to 1st Edition. Now it doesn’t say it here, but earlier in the book, it indicates that the scale for this Dungeon is 1 square = 10 feet. So not only is this Dungeon labyrinthine, it’s massive. Which I like–it provides a great jumping off point for burgeoning DMs looking to create their own complexes. 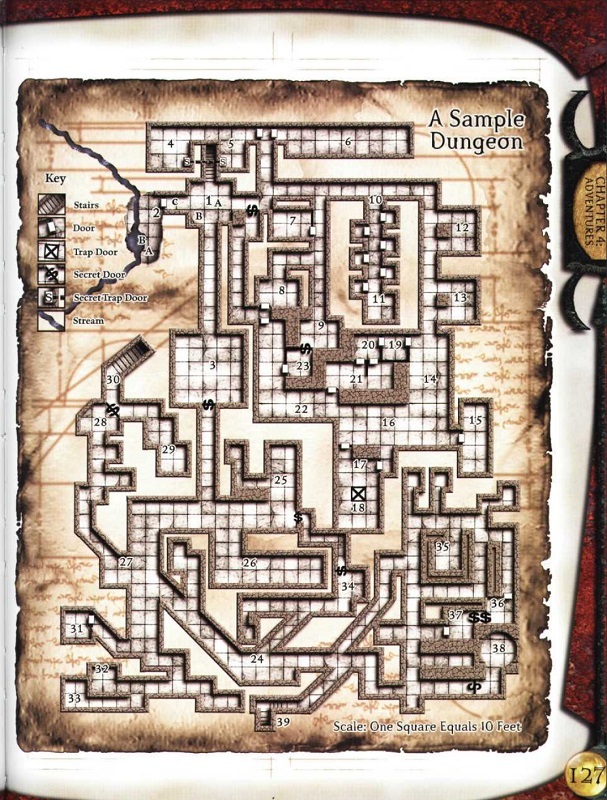 It echoes the massive layouts that the Dungeons the creators of the game were traipsing through–and if this is your first brush with creating your own layout, it also has a lot to teach you about how to seal off wings of the Dungeon (of course if you want your players to find it, maybe point them back towards a “dead end” with some clues elsewhere in the Dungeon. Twenty-one years later, the Sample Dungeon was still alive and kicking, though now with some updated art to reflect the style of the day. 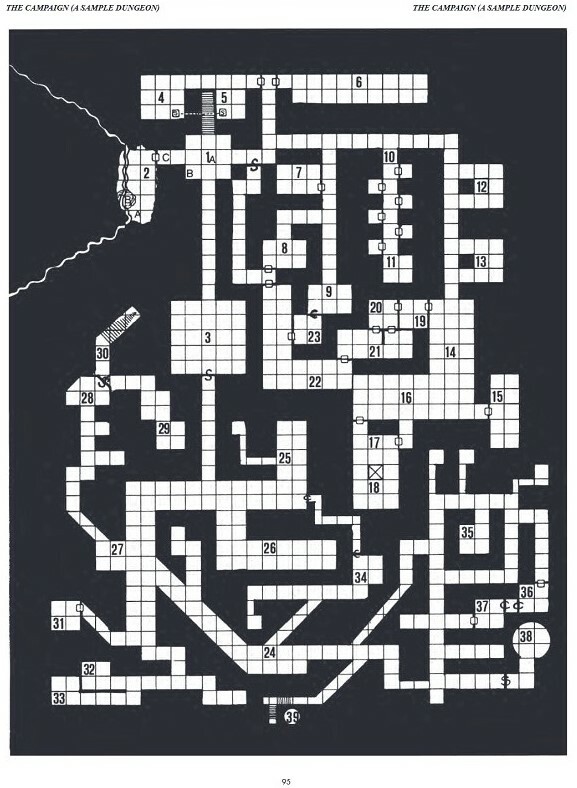 Printed back in the year 2000 in the 3.0 Dungeon Master’s Guide, the Sample Dungeon came crashing back onto the scene, introducing a new generation of Dungeon Masters to its twisting angular corridors. And with 3rd Edition’s focus on maps and grids this one felt like a great way to translate to the battlemats that also became quite popular in the day (and now are becoming harder to find). And 5th Edition, with its love for the history of D&D features the same map, 35 years later, back in 2014. 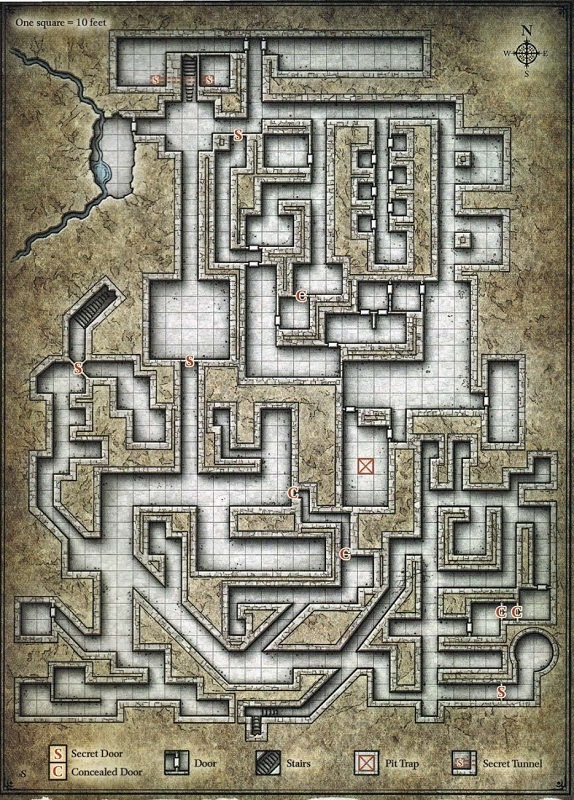 Now as D&D turns 45, and the Sample Dungeon turns 40, we thought we’d feature this map once more, so those of you who maybe haven’t seen this map yet can check it out and give yourselves a crash course in Dungeon Layout. There’s a lot going on here–but you can basically carve the Dungeon up into two halves. Assuming you start in Room 1, there’s part A which is the interconnected series of corridors attached to Room 1, and Part B, which is the section of Dungeon walled off behind the secret door in Room 3. Which makes it easier to parse as you’re going through them and figuring out what you want to populate them with. This lone detail of “this part of the Dungeon is hidden from people who ostensibly don’t know about the door” gives you so much to play with. It suggests that stuff in that part of the Dungeon might be more sinister or mysterious, which can help you fill in the theme for this place. Then there are all of the other hidden doors, which make you wonder what purpose they served. To what end do the denizens of this Dungeon make use of it? It also rewards players who explore (one of the big three pillars of the game). The first part of the dungeon might reveal some of the secrets if your players are attentive while mapping–all the areas in A can be found just by exploring the Dungeon. But in order to find a way down, they’ll have to find the secret door, which might mean locating a reference to “the second level” or getting some other clue that says they’ve missed something. Or, your players will roll hot when searching every room obsessively and they’ll blow right past your carefully crafted mystery. This too is a time-honored part of Dungeons and Dragons. So whether you’re running through this map, or just glad for a quick and finished dungeon that’s big enough to buy you time to do the planning you need, enjoy this part of D&D history.